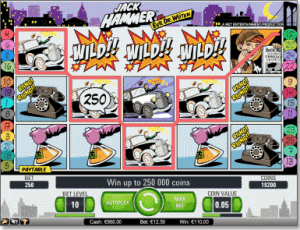 Jack Hammer is a five-reel, three-row video slots game with 25 pay-lines. It’s in the style of an old school comic book with cartoon lines and block colours. If you’re familiar with the Tintin comics you’ll see Jack Hammer slots has a similar look to it. It’s a really neat little slots game we’d recommend to new slots players and pokies enthusiasts alike. In Jack Hammer there are 10 bet levels with the coin values varying from 0.01-1.00 so you have a lot of control over how much you bet on each spin. Note that any bet line wins made are multiplied by the number of coins selected. Once you’ve selected your betting amount per spin hit the green button in the centre of the screen to start the game. The theoretical payout rate for Jack Hammer is stated to be 97.00% so your odds aren’t looking bad. There’s the option of hitting the autoplay button, which will autoplay for you for a set number of rounds so you don’t have to keep hitting the spin button. If you go into the advanced settings section you can customise when autoplay will stop. For example, instead of having it stop after a certain number of rounds you can choose autoplay to halt if any win is made or if your cash is increased by a specified amount. Any winnings you make while in autoplay mode will be collected automatically for you. You can also hit the Max Bet button, which will set your betting amount to the highest possible amount (both the highest bet level and the highest coin value). When you spin a winning bet line or three or four Scatter symbols it will trigger a Sticky Win round. In Sticky Win rounds the winning icons that match are kept in place but all the other icons on the reels are spun so you have the chance for even bigger wins. So Sticky Win rounds begin if you have three or four Scatter icons on your reel, however, if five of more Free Spin symbols appear then a round of Free Spins will be activated. A round of Free Spins plays for you at the same bet level and coin value that was in place when the Free Spins round was activated. The Free Spin rounds in Jack Hammer are exceptionally rewarding in that any winnings you make are multiplied by three and it is possible to unlock Sticky Wins rounds and win more Free Spin rounds while in a Free Spin round. Jack Hammer was designed by NetEnt, which is one of the best gaming software developers in the world. NetEnt is made up of more than 500 game developers who are dedicated to creating innovative, industry-leading games. NetEnt has stated before that it wishes to create the casino games with the best sound, graphics and mathematics (it is talking about its random number generators here). We believe it has achieved this perfectly with the game Jack Hammer. Jack Hammer showcases the best of what NetEnt can do and shows how the company has made a name for itself. We love Jack Hammer for its 1920s cartoon theme – they’ve nailed it in every aspect of the game. The cartoon drawings are spot on and the colours are vibrant enough to catch your attention but still look like they were made for another era. They also have a good soundtrack for a slots game; there’s some nice background music but the game sounds only really pick up if something exciting is happening. We thought the music and special effect sounds were spot on but, of course, if the ambient sounds or sound effects aren’t for you then you can turn off either or both of these soundtracks. Most importantly, though, we love this game because it’s exciting – you have the chance to win plenty and there are thrilling features such as Sticky Win rounds to keep interest levels up throughout the game. Jack Hammer is a NetEnt creation, so you can play it at web casinos that use NetEnt as one of their gaming software developers. The casinos recommended in our table above are the most reputable online casinos that will reward you for playing with real money and will keep all of your financial and personal details 100 per cent safe. You can play Jack Hammer at these recommended casinos instantly, without downloading any additional gaming software, and you have the option of playing the game for fun in practice mode or for real money. If you do wish to play for real money there are a heap of safeguarded payment options, these trustworthy casinos are dedicated to making the deposit process as efficient and easy as possible.